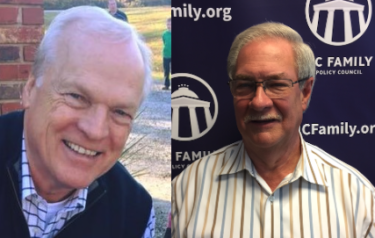 The North Carolina Family Policy Council Board of Directors said a very fond farewell last week to departing Board Chairman Henry Williamson (right) for his many years of faithful service and leadership. At its quarterly board meeting on Thursday, the Board also welcomed Alan Cole (left) as the Council’s newest Chairman with unanimous consent. Williamson and Cole, both of Winston-Salem, have been supporters and board members of NC Family for many years. The North Carolina Family Policy Council was founded in 1992 as a 501(c)(3) nonprofit organization designed to identify, develop and support public policies that preserve and strengthen Judeo-Christian family values.